Engineers and acousticians have known for years that the sound barriers bracketing America’s urban and suburban highways are only marginally useful, and that a variety of better technologies could be developed. Sound moves in not-so-mysterious ways, meaning that typical sound barriers have only limited effectiveness. But because noise travels in waves, not straight lines, sounds can and do go over the walls. This is why even with barriers standing 16 feet, homes several blocks away can hear the highway. Part of the sound wave is absorbed, part is reflected away from the wall, and part is transmitted through, Berrios explained. “Most of it goes above the barrier and gets diffracted, and gets to the receiver,” — that is, to a resident’s ears — he said. This is especially problematic during certain weather conditions. 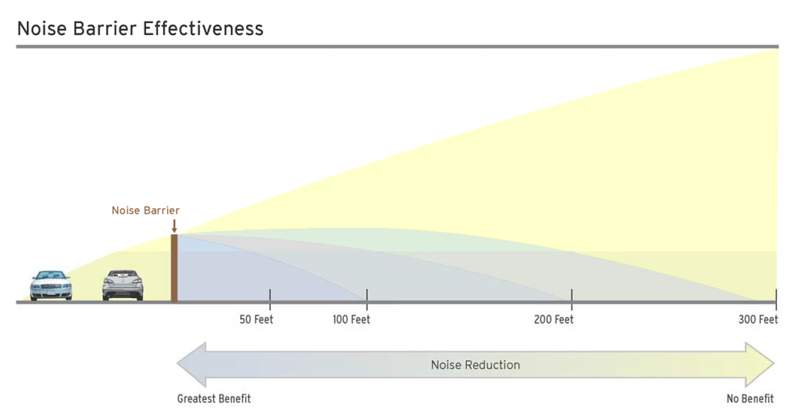 When the consulting firm Bowlby & Associates, in Franklin, Tennessee, measured sounds around a highway in a yet-to-be-published study, they found that residents hundreds of feet from the highway could hear sounds some 5 decibels louder if the wind was blowing towards them, said Darlene D. Reiter, the firm’s president. Source: On Highway Noise Barriers, the Science Is Mixed. Are There Alternatives?